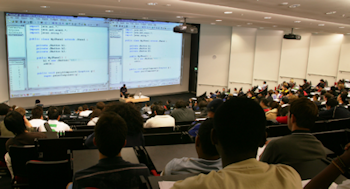 Many students find learning to program very difficult. 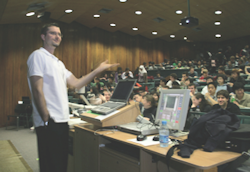 Although most students arrive at University as experts in using computers and application software, they often have little understanding of how computer programs are created. Programming requires great precision and patience. Unlike people, who can make sense of written information containing multiple spelling and grammatical errors, a computer is completely unforgiving - the smallest errors render a program unusable. While the science of computing is heavily theory based, the practice is very much an art form, requiring creativity and experience. Teaching both the science and art of programming, particularly introducing novices to the principles of programming, is an enjoyable challenge and one that I find very rewarding. I teach courses in programming and in the use of technology in education at the University of Auckland in New Zealand. I like to involve students in community-oriented activities, in which they are responsible for creating and sharing their own learning resources. I believe these kinds of activities can help students build self-awareness of learning processes and give them a sense of control over their learning. This kind of engagement emphasises higher-order cognitive processes such as evaluation, reflection and critical thinking. and can transform students from being passive receptors of information to becoming active and critical members of a community engaged in the process of knowledge construction. I have received the University of Auckland Teaching Excellence Award (2008), the National Tertiary Teaching Excellence Award (2009) and the Computing Research and Education Association of Australasia Teaching Award (2010). My research interests involve developing and evaluating technologies for supporting collaborative learning, particularly involving student-authored resources. An example of this work is the freely available PeerWise tool with which students author, share and discuss course-related assessment questions. In 2009, PeerWise won the Australasian Association for Engineering Education Award for innovation in curricula, learning and teaching. and is now used at more than 1000 universities and schools around the world. I am also interested in exploring the efficacy of virtual rewards - such as badges, scoring systems and social leaderboards, which are widely used outside of education - for motivating student participation in online learning environments.